It's been a week since I posted! It has been a rainy week----but still no frost. I harvested another 24 red tomatoes and 2 peppers on Friday. 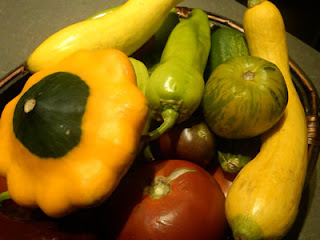 No frost in the forecast this week----so I hope to visit the garden more often this week. Here is a picture of the many colors of peppers, tomatoes, and squash from my garden as well as our local farmer.